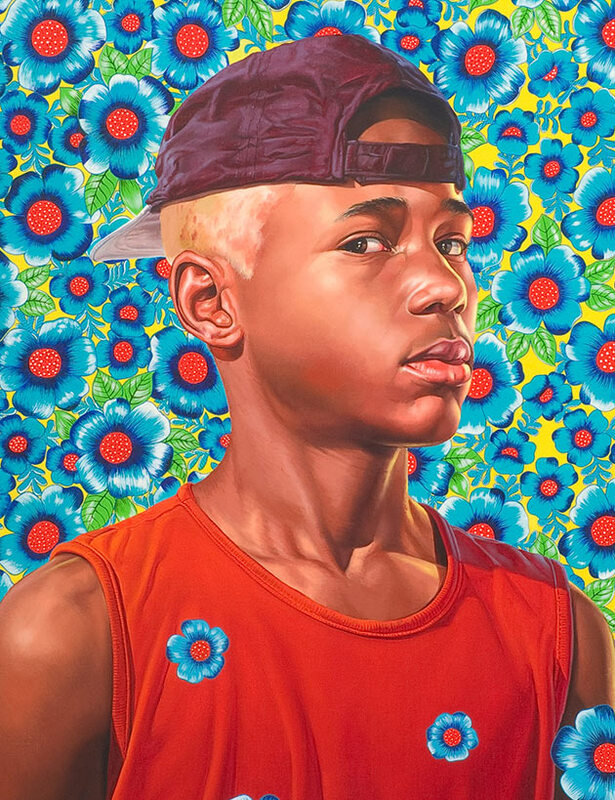 Randerson Romualdo Cordeiro, 2008, Kehinde Wiley. See it ​First​. ​See it free. Membership gives you unlimited free admission and exclusive access to previews and member-only events. Kehinde Wiley is one of the leading American artists to emerge in the last decade and he has been ingeniously reworking the grand portraiture traditions. 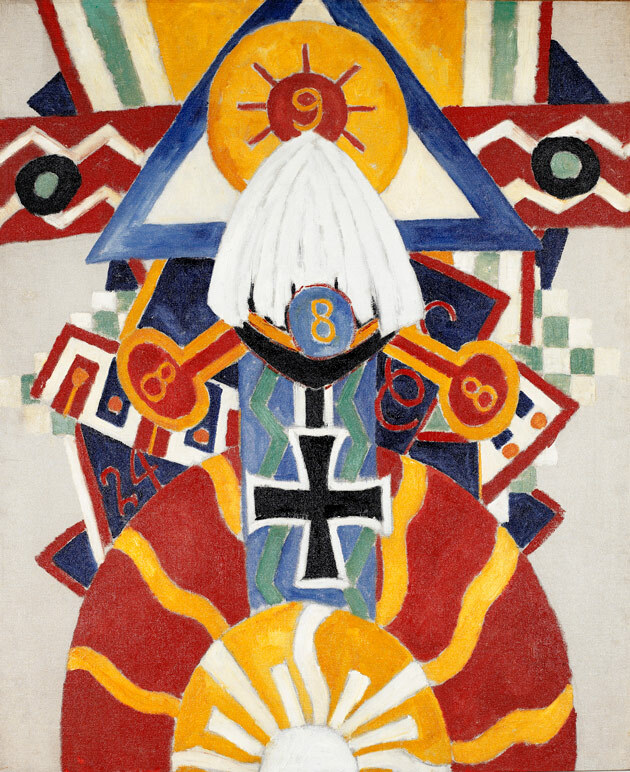 Since ancient times the portrait has been tied to the representation of power, and in European courts and churches, artists and their patrons developed a complex repository of postures and poses and refined a symbolic language. This language, woven into all aspects of a portrait, described the sitter’s influence and power, virtue and character, or profession. In his consideration of portrait traditions, Wiley has been especially drawn to the grand aristocratic portraits of the 18th century. The artist began his first series of portraits in the early 2000s during a residency at the Studio Museum in Harlem. He set out to photograph and recast assertive and self-empowered young men from the neighborhood in the style and manner of traditional history painting. Since then he has also painted rap and sports stars but for the most part his attention has focused on ordinary men of color in their everyday clothes. Trained at Yale in the 1990s, Wiley was steeped in the discussions concerning identity politics during this decade and he brings his personal insights and theoretical studies to his practice. 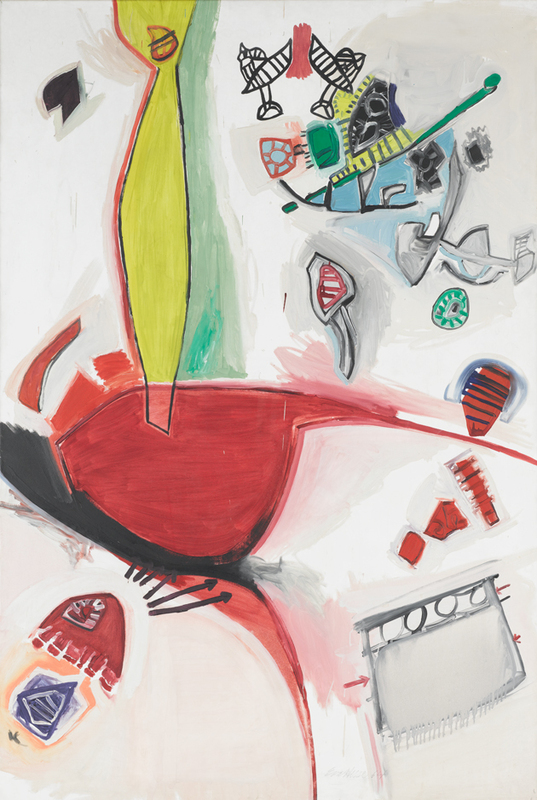 Wiley’s portraits are highly stylized and staged, and draw attention to the dialectic between a history of aristocratic representation and the portrait as a statement of power and the individual’s sense of empowerment. The exhibition is organized by the Brooklyn Museum. 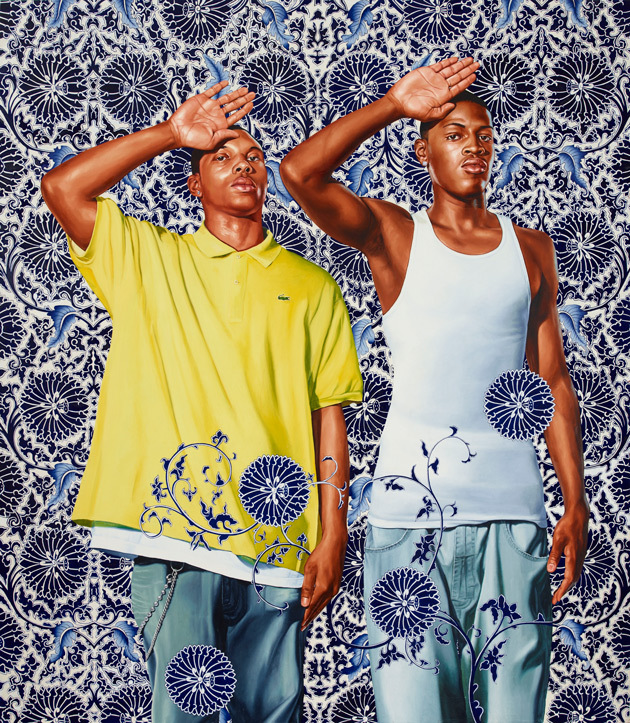 Two Heroic Sisters of the Grassland, 2011, Kehinde Wiley. Wiley arrived at his grand portraits from an unlikely inspiration: a mugshot of an African American man in his twenties, found on the streets of Harlem. Wiley believed mugshots were a form of portraiture, but the difference between this form and classic eighteenth century portraits is that one image was under the control of the sitter, and the other was not. Portraits that mark this dichotomy are shown in the second gallery of the exhibition. Mugshots mark a person as an offender, and yet the face in Wiley’s paintings is, as he describes it, pleasant and composed. Contrasting with these mugshot paintings are portraits of young men who are firmly in control of their image. One characteristic example shows a young black man in fashionable street wear identified as Portrait of a Venetian Ambassador, Aged 59, II. The contrast between the official role implied by the title and the appearance of the young man in hip-hop attire and casual stance bring the many contradictions regarding class, demeanor, race, and age that is all wrapped up within a history of portraiture to the fore. Saint John the Baptist in the Wilderness (detail), 2013, Kehinde Wiley. Portrait of a Venetian Ambassador, Aged 59, II, 2006, Kehinde Wiley. Dogon Couple (detail), 2008, Kehinde Wiley. Portraiture has a long history in Western Art reaching back to ancient Greece and Rome when realistic portraits were fashioned in a variety of media. 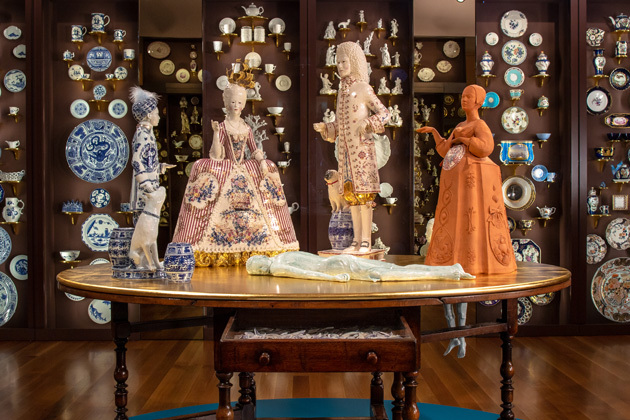 Exquisite robes and furnishings, the color of a gown, grand gestures and poses—even ornaments and flowers—were rich with symbolism and meaning. Though portraits have historically been recognized as representations of power, mobility, and status, classical portraiture traditions have excluded people of color. With Kehinde Wiley’s work, black individuals are emphatically celebrated in grand and life-size portraits. Portrait of Andries Stilte, 2006, Kehinde Wiley. Napoleon Leading the Army over the Alps, 2005 Kehinde Wiley. Portrait of Mary Hill, Lady Killigrew (detail), 2013, Kehinde Wiley. Apart from the secular rulers who held power in Europe well into the 19th and early 20th centuries, the church was the second power that determined the course of history. Portraits of biblical figures had a commanding presence in churches, palaces, and in the European imagination—often these were the only portraits that ordinary people would see. The biblical protagonists in these paintings reflected European Christian values, and were fashioned in the image of the white ruling class. 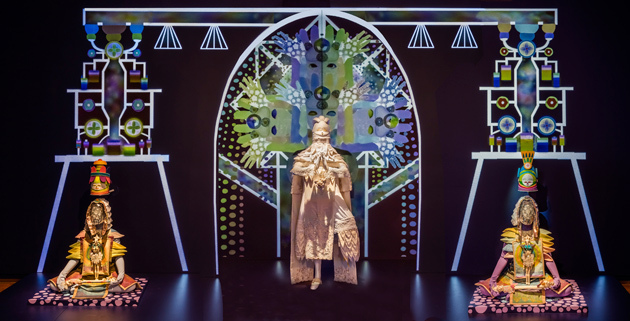 Wiley’s religious portraits intervene on several levels—most importantly, they insert black men and women into the canon of biblical figures to rectify this misrepresentation. His gilded images mark a distinctive contrast between the church’s exaltation of spiritual passions and the denial of the flesh. Wiley’s saints put the body front and center—fitted tank tops and T-shirts expose beautiful physiques, the men’s flexed muscles amplified by the golden glow of their skin. King and the High Priest, 2014, Kehinde Wiley. 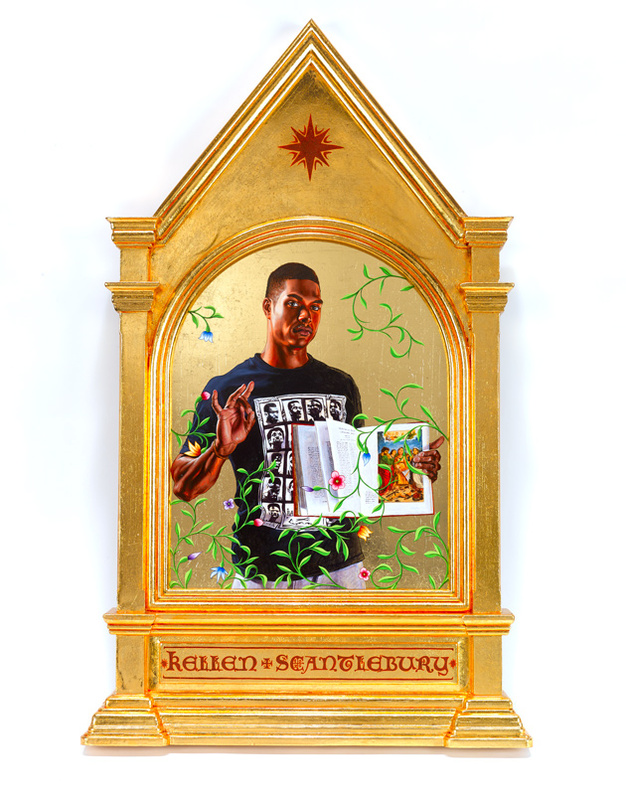 After Memling's Portrait of Man with a Coin of the Emperor Nero, 2013, Kehinde Wiley. Learn more about history, the artistic process, and themes in selected artworks in the Kehinde Wiley: A New Republic exhibition with a free augmented reality smartphone experience. Download the free Layar app onto your iPhone or Android smartphone. Free SAM WiFi is available. Look for the Layar symbol near selected works of art. Using the Layar app, hold your phone up to scan the artwork and discover interactive content. Please use headphones. 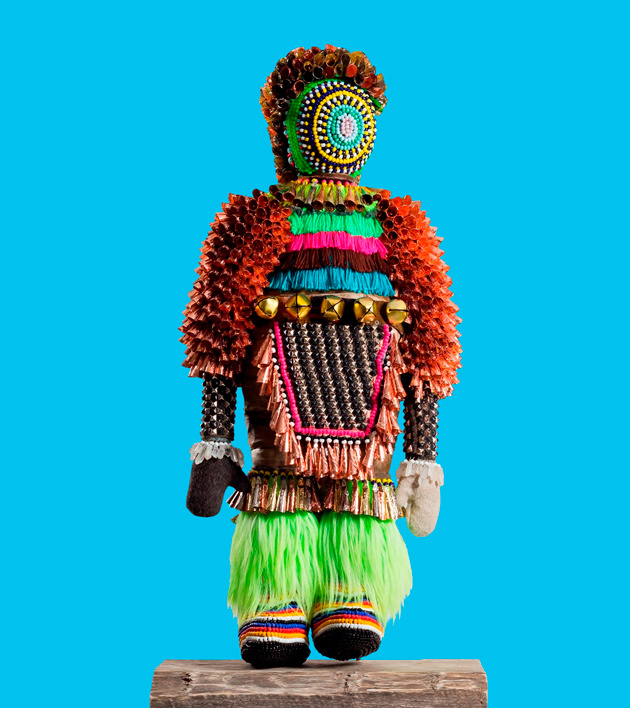 Tickets are available online or at the Seattle Ar​t Museum. Unlimited free admission, members-only events, and more! 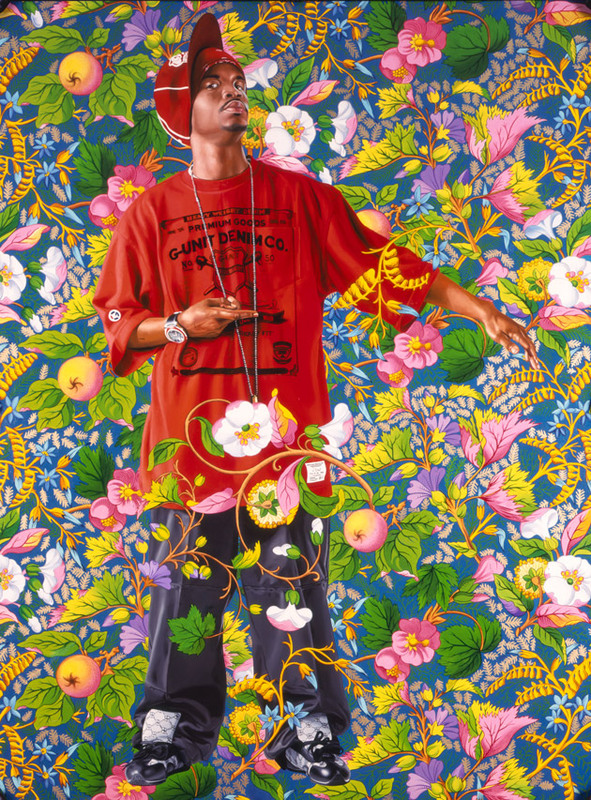 IMAGES: Randerson Romualdo Cordeiro, 2008, Kehinde Wiley, American, b. 1977, oil on canvas, 48 x 36 in., Private collection, Golden Beach, Florida, courtesy of Roberts & Tilton, Culver City, California, © Kehinde Wiley, Photo: Robert Wedemeyer, courtesy of Roberts & Tilton. 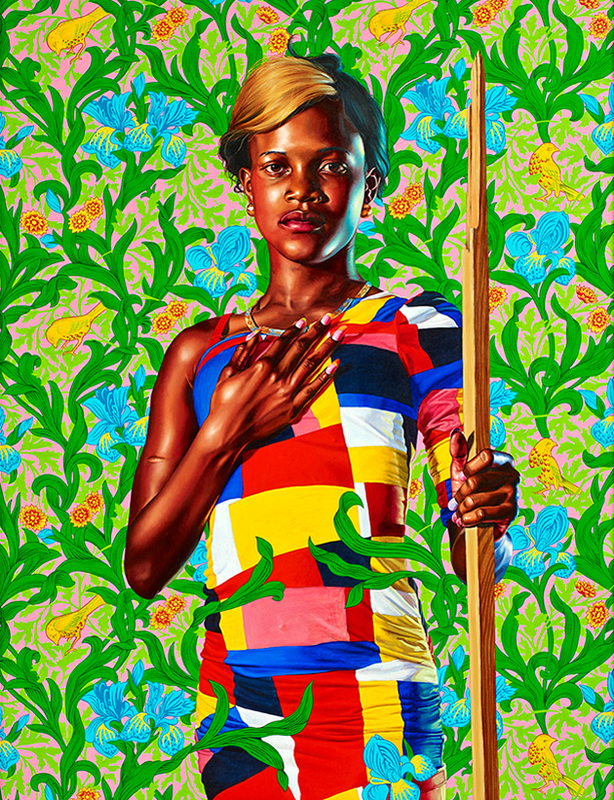 Two Heroic Sisters of the Grassland (detail), 2011, Kehinde Wiley, American, b. 1977, oil on canvas, 96 x 84 in., Hort Family Collection, © Kehinde Wiley. Morpheus (detail), 2008, Kehinde Wiley, American, b. 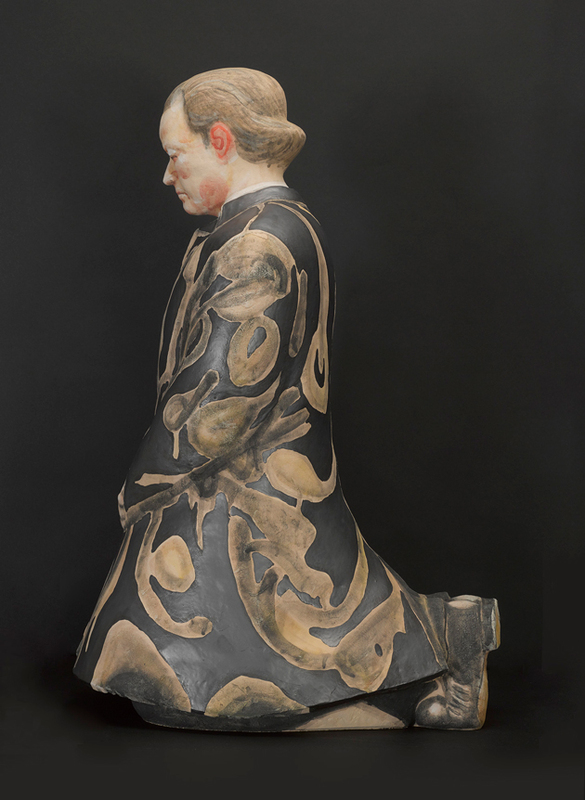 1977, oil on canvas, 108 x 180 in., Courtesy of Roberts & Tilton, Culver City, California; Sean Kelly, New York; Galerie Daniel Templon, Paris; and Stephen Friedman Gallery, London, © Kehinde Wiley. Saint John the Baptist in the Wilderness (detail), 2013, Kehinde Wiley, American, b. 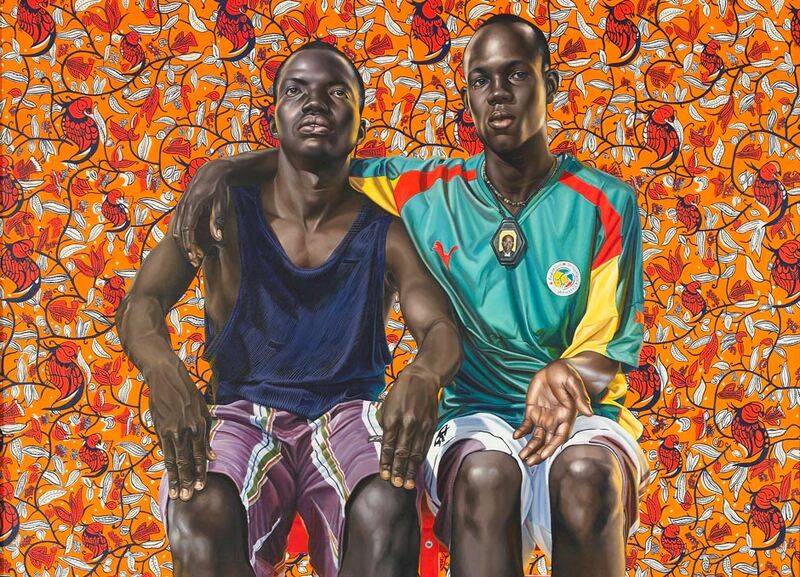 1977, oil on canvas, 48 x 36 in., Colección Saorín & Sobrino, © Kehinde Wiley, Photo: Stephen White, Courtesy of Stephen Friedman Gallery. Portrait of a Venetian Ambassador, Aged 59, II, 2006, Kehinde Wiley, American, b. 1977, oil on canvas, 96 x 72 in., Private collection, Pacific Palisades, California, courtesy of Roberts & Tilton, Culver City, California, © Kehinde Wiley, Photo: Anthony Cuñha, courtesy of Roberts & Tilton. Dogon Couple (detail), 2008, Kehinde Wiley, American, b. 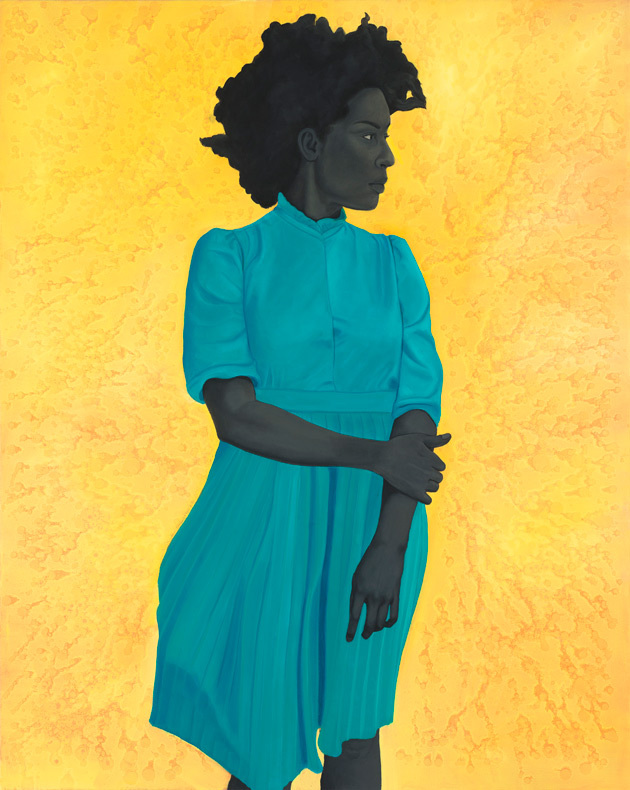 1977, oil on canvas, 96 x 84 in., Harn Museum of Art, Gainesville, Florida; Museum purchase, funds provided by the David A. Cofrin Acquisition Endowment and Caroline Julier and James G. Richardson Acquisition Fund, 2008.50, © Kehinde Wiley. Portrait of Andries Stilte, 2006, Kehinde Wiley, American, b. 1977, oil and enamel on canvas, 96 x 72 in., Private Collection, Golden Beach, Florida, © Kehinde Wiley. Courtesy of the artist and Roberts & Tilton, Culver City, California. Napoleon Leading the Army over the Alps, 2005 Kehinde Wiley, American, b. 1977, oil on canvas, 108 x 108 in., Brooklyn Museum, Collection of Suzi and Andrew B. Cohen, © Kehinde Wiley. 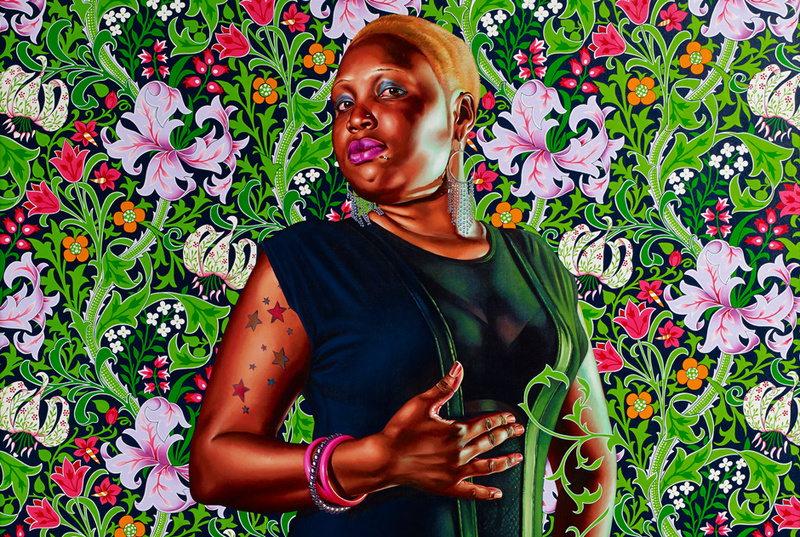 Portrait of Mary Hill, Lady Killigrew (detail), 2013, Kehinde Wiley, American, b. 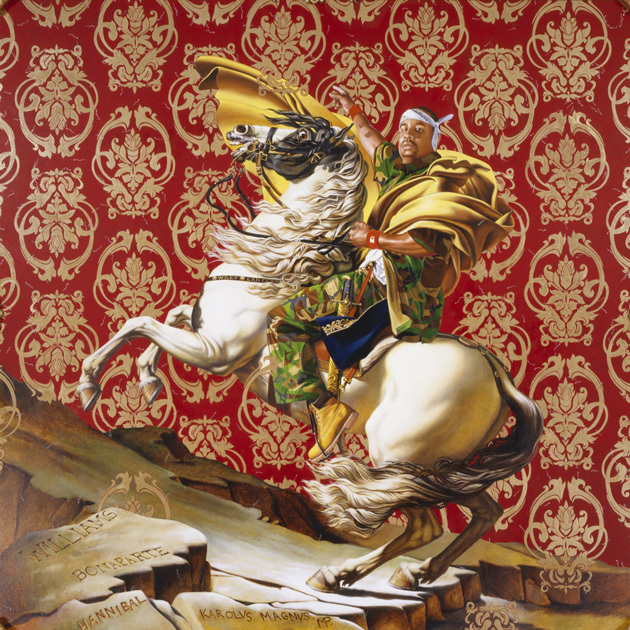 1977, oil on canvas, 72 x 60 in., Collection of Guillermo Nicolas and James Foster, © Kehinde Wiley, Photo: Stephen White, Courtesy of Stephen Friedman Gallery. King and the High Priest, 2014, Kehinde Wiley, American, b. 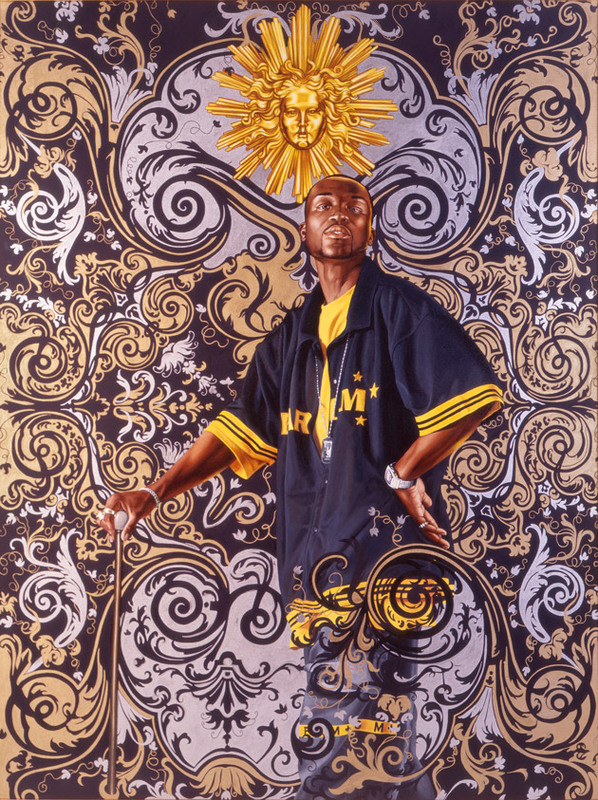 1977, 22k gold leaf and oil on wood panel, 40 x 24 x 2 in., Private collection, Montréal, Canada, courtesy of Sean Kelly, New York, © Kehinde Wiley, Photo: Max Yawney. 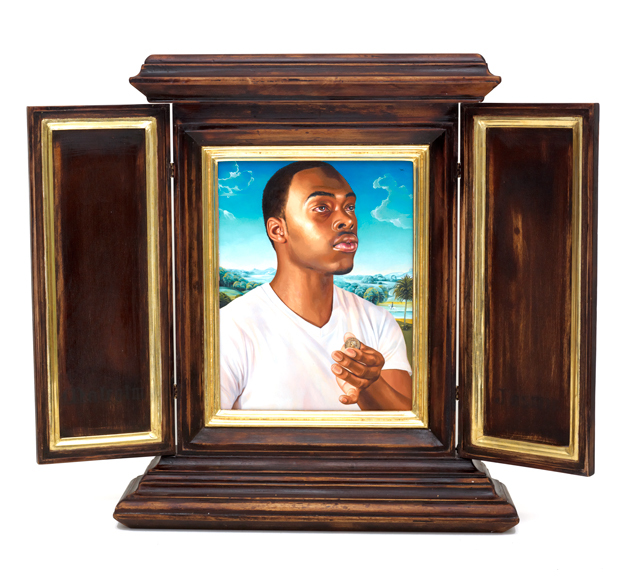 After Memling's Portrait of Man with a Coin of the Emperor Nero, 2013, Kehinde Wiley, American, b. 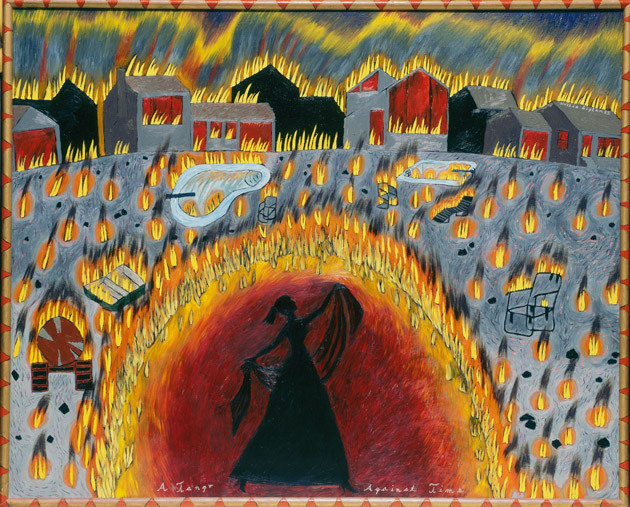 1977, oil on wood panel in artist-designed hand-fabricated frame with 22k gold-leaf gilding; with doors open: 24½ x 29 x 5 in., Phoenix Art Museum; Museum purchase with funds provided by The Marshall Bequest, Contemporary Forum, Dr. Eric Jungermann, Ann and Michael Wall, Mr. and Mrs. James G. Bazlen, BMO Private Bank, Dr. and Mrs. Marshall Block, Iris Cashdan-Fishman, Mr. and Mrs. Richard N. Goldsmith, Clark Olson and Nick Butler, Norman McLash, Mr. and Mrs. Charles G. Watts and others, 2013.526, © Kehinde Wiley, Photo: Max Yawney, courtesy of Roberts & Tilton, Culver City, California.